Convinced of the need to reinstate the role of art as a driving force in social change, Catherine Bastide is committed to the development of a network of artists and thinkers who encourage sustainable development opportunities and behaviours on a local and global level, and who work to create the conditions of improved social justice. Convaincue de la nécessité de ré-instaurer la place de l'art comme une force motrice de transformation sociale, Catherine Bastide s'est engagée dans la création d'un réseau d'artistes, d'intellectuels, d'activistes et de professionnels qui œuvrent à explorer - sur le plan local comme sur le plan global - de nouveaux comportements qui favorisent le développement durable. 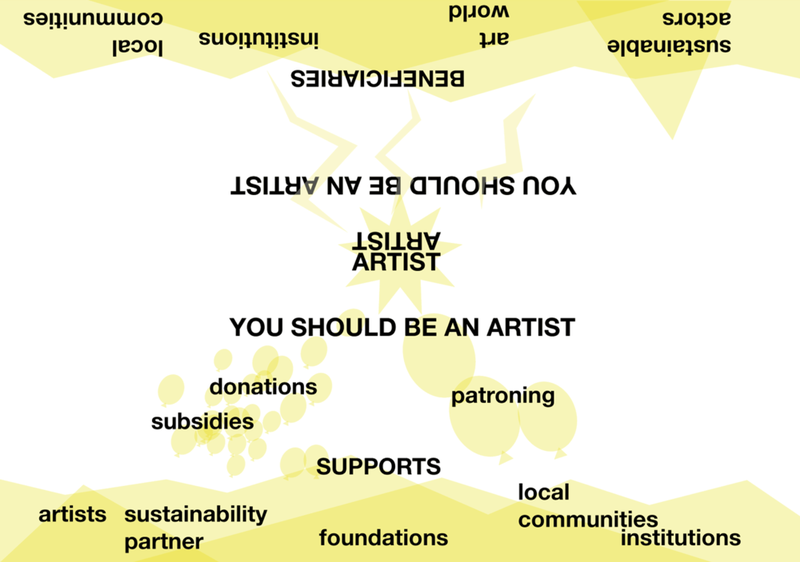 You Should Be an Artist is a fund project proposed by Catherine Bastide created to support, encourage, and strengthen the social transformative power of artistic practices involved in sustainable development issues. You Should Be an Artist believes in the economic and creative power of Art to engage with contemporary global challenges. On 25 September 2015, the 194 countries of the United Nations General Assembly adopted the agenda for Sustainable Development and its 17 Global Goals (Sustainable Development Goals SDG’s) Covering a broad range of sustainable development issues the Agenda reveals the critical state of our planet, both on social and ecological levels. In 2016, the European Alliance for Culture and the Arts advocated a better integration of artistic and cultural fields in the European strategy to achieve the Sustainable Development Goals. This strategy mentions the transformative power of the arts, culture and creativity and its integration at the core of sustainable development strategies. While global institutions and governments are legislating for change, citizen-based actions are increasingly growing. The current state of emergency is generating bottom-up initiatives, led by individuals, more local and more focused, that empower and implicate communities. You should be an artist is a collective of like-minded partners willing to expand their shared passion of art to more social or global engagements. You Should Be an Artist brings together artists, researchers, experts, activists, NGOs, art institutions and foundations, united in a proactive and philanthropist spirit, to promote artist-based actions through collaborative research and its concrete applications, education and awareness, dissemination of knowledge and skills, community engagement and the promotion of social transformation towards more sustainable behaviors. Alongside creative input, contributions may take the form of structural support, advice, technical knowledge and financial participation. This fund was inspired by the model of Les Nouveaux Commanditaires. You Should Be an Artist is a fund created to support, encourage, and strengthen the social transformative power of artistic practices involved in sustainable development issues. You Should Be an Artist believes in the economic and creative power of the artists to engage with contemporary global challenges, to take action locally on global environmental and social issues. Actors of the art scene, whether they are artists, collectors, institutions and organisations are increasingly getting involved in sustainable development actions. The current crisis and state of emergency is generating bottom-up initiatives, more local and more focused, led by individuals and that empower and implicate the communities. In 2016 The European Alliance for Culture and the Arts advocates for a better integration of the artistic and cultural domains in the European Strategy to achieve the 2030 objectives of the United Nations for Sustainable Development (SDGs) You Should Be an Artist, acknowledging the current state of affairs, wants to go beyond and advocates for the inclusion of artistic practice at the core and heart of the action, as the reason and the means of acting. The funds has for mission to the promote the social transformative power of arts towards more sustainable behaviors on a local and global level; to contribute to education and to the dissemination of knowledge and skills. YSBAA supports artists as social entrepreneurs or activists, willing to engage locally through their art by acting towards long-lasting ecological or social issues. YSBAA brings together experts in arts, experts in sustainability and civilians to sustain scenarios where all parts are beneficiaries. YSBAA generates a resourceful network to share knowledge, discover innovative tools and create new partnerships needed to succeed in the missions of pushing forward the SDGs in all regions. The funds reinforces a community of like-minded partners involved and passionate about of art, social engagement and environment issues. Within You Should be and Artist, artists, NGO, art institutions, foundations and individuals are united by the same philanthropist, participative and proactive spirit. Their contribution to the project whether it is through their artistic practice, financial contribution,structural support, advice or technical knowledge etc. ; will make them ambassadors of the project. YSBAA is developing a program of of curated events to promote the supported projects and the mission of the fund. The events are planned accordingly to the calendar of international art gatherings in various international locations: Exhibitions — Symposia — Talks and lectures — Visits. You should be an artist is fed by established artists, philanthropists, foundations and art institutions willing to invest in meaningful project and impacting actions. YSBAA want to collaborate with institutions that believe in the future of socially engaged artists and that want to contribute to growth of this contemporary form of artistic expression. a.) Virtual — You Should Be an Artist has an online platform that is the main tool to widespread communication to the public, to connect the different actors of the projects and to build a global network: information; calendar; call for projects; resource; mapping; events; … b.) Physical — YSBAA is based in Brussels and Marseille. YSBAA has a network of potential public and private spaces to organize gatherings and events. Catherine Bastide: sourcing artists and philanthropists. Sourcing partnerships in the art field and Founder of YSBAA. Pierre Échard: leading the scientific committee, communication with representations of sustainable development partners. Advisory team: a board of Art specialists; a board of Sustainable Development specialists; Investment board.